Since there is a wealth of knowledge on RBR, this sticky should help the beginners. This FAQ will evolve over time, so if there is a thread that should belong in this FAQ, please notify a moderator of this forum. Ask Questions. There are mostly no dumb questions. The dumb questions are the ones you wanted to ask, but didn't, then screwed something up. Be respectful. No one was born a pro-cyclist or a pro-cyclist's mechanic. Be respectful when quoting from The Rules. Do not quote Rule #5, HTFU. People who quote Rule #5 will have their post deleted, even if it contains useful information. Lennard Zinn is also another often quoted source of information on RBR, both his Velonews articles as well as his books. Racing: These days it's your basic road bike. Relaxed/Endurance: Yes, it's a race bike. They were developed for the grueling cobblestones of the Paris-Roubaix. Endurance geometry bikes differ from race bikes as the are tweaked for additional comfort over a road bike: taller headtube, slacker fork angle which leads to a more upright position (though it can be tailored in the fitting session); additional modifications to the frame for increased vertical compliance, ie: curved seat stays, longer, shaped chainstays, etc. Some offer strategically placed elastomer inserts. They tend to come with 25mm tires as standard for increased tire volume to cushion. As a result, they may be "less responsive" to your inputs. Relaxed/Endurance tend to cost slightly more. Time Trial: Bikes designed to be as aerodynamic as possible, for a Time Trial race. Hybrid: A Hybrid replaces the drop bar for a flat bar type. They tend to use MTB-like trigger shifters. They tend to have larger volume tires (in the 35mm range). There is heavy emphasis on comfort. Some have cheap suspension fork like a Hardtail MTB. Traditional "road" frames have been built with level top tubes since the early 1900s. The influence of mountain and BMX bike design has led to the increasing popularity of frames with sloping top tubes, higher at the front. "Compact" road frames have sloping top tubes, and are intended to be used with a long seatpost. Compact frames are a little bit lighter than traditional ones, but this is partially offset by the weight of the longer seatpost. Some riders believe these frames are stiffer. When lines extending forward from the down tube and top tube intersect directly above the front axle, as is usual with a road frame, weight loading only tensions, does not the down tube and compresses the top tube, imposing no bending loads on them. When the intersection is behind the axle, he frame is better at resisting braking loads. When the intersection is ahead of the axle, the bending loads on these tubes require the front end of the frame to be of stronger construction. Manufacturers like compact frames because they are more versatile in terms of fit. Usually 3 or 4 sizes are enough to fit 98% of customers. This saves a lot of money for a manufacturer who doesn't need to deal with so many different sizes. 3 Major brands: Shimano, Campagnolo & newer to the party, SRAM. There are other brands also, but these are the major "brand-categories"
Campagnolo came shortly after Shimano introduced STI. Campy uses both a thumb shifter (like the original STI) and a paddle shifter (which Shimano later incorporates into their design). what's this replaceable link I hear of? Prior to this, you had no choice but use a chain breaker to install and remove a chain. The replaceable link, comes in many flavors, including Wippermann, KMC & SRAM. How to tell if chain is worn? See: Chain Maintenance then scroll down to "Measuring Chain Wear" (or search within your browser window). What about the chain wear tool that companies like Park Tool sells? If you're not careful, and it is easy to be not careful, you can get a "false negative". If you have one, use it gently. If it indicates you need a new chain, see above on how to actually measure it. Width vs Rolling Resistance: One of the newer trends, which came with a lot of resistance, pun intended is going with a 25mm tire vs 23mm. See this thread back in 2011. 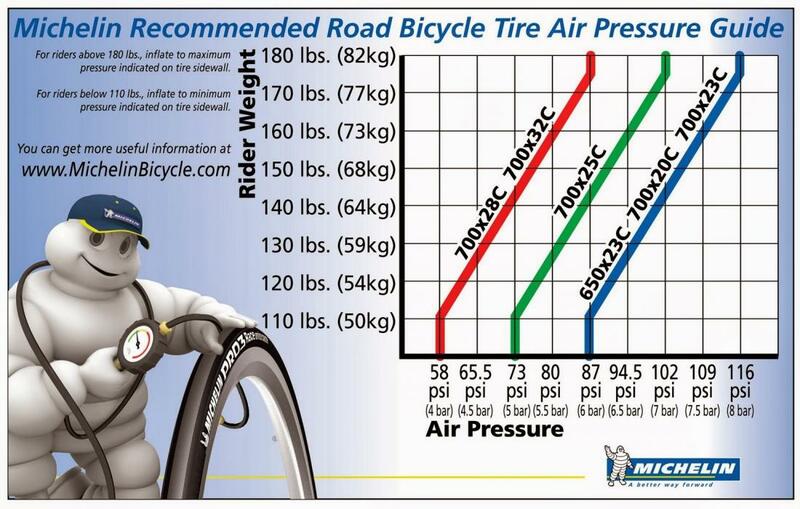 Tire Pressures: The Michelin guide below is a commonly referenced chart, as a starting guide to pressures. Also see Sheldon Brown website on tires. Keep in mind, because less weight is over the front tires, you can decrease the pressure compared to the rear, for greater comfort as well as traction. Quick note, if you have a patch kit, then it would to advised to patch the tire at the site of the puncture. 2009 Specialized Rockhopper Comp 29er upgraded to SRAM X9 with 1x10 and Stan's Arch EX rims and tubeless. ARRRRRRRRRRRRRRRGHHHHHHH! i clicked on beginner's corner by mistake!!!!!!!!!!!!!! Welcome to the new Beginner's Corner Forum!